This stainless steel grocery bag dispenser has over one hundred thirty reviews on Amazon . 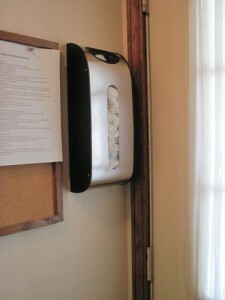 One hundred and seventeen of them gave this kitchen cabinet door bag dispenser four to five stars out of five. This is a great product to help you reduce clutter and get more organized. What tools will be needed to install the unit? It will literally take a couple of minutes to move a few things out of the way. When there is plenty of room for the cupboard door to close properly once the container is installed, peel the protection off of the tape and stick the trash bag container to the door. Once you have it attached with the double-face, foam tape, pre-drill the holes for the installation screws. How hard is it to get the bags in the stainless steel holder? You can stuff them in through the top or the front of the bin. You can get a ton of reusable bags inside. How big is the Simplehuman bag dispenser? The stainless steel bin is four inches (4″) by six inches (6″) by fifteen and a half inches (15-1/2″). The overall shipping weight is around two bounds (2lbs.). How many bags will fit in the holder? You can comfortably get thirty standard-sized plastic grocery bags inside. Can I install it somewhere other than on the back of a kitchen or bathroom cabinet door? Yes! You can fasten it whereever there is a flat surface and you need to store reusable grocery/trash bags. Is everything included that I will need for installing the container? Yes! All of the screws and the double sided tape are included with your purchase. If you are planning on fastening it into drywall you may need to get some wall-anchors from the hardware store. What kind of warranty comes with the stainless steel kitchen cabinet door grocery bag holder? There is a ten (10) year limited warranty that you get when you register the product. This is a very attractive kitchen cabinet door bag holder. 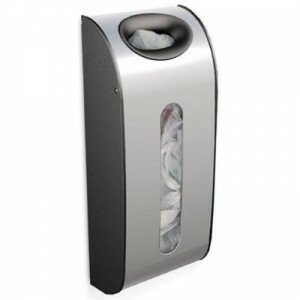 All of the reviews for the Simplehuman grocery bag dispenser bins I read were extremely positive. There are thousands of uses for these reusable plastic bags. This bin makes organizing them into neat order a simple process. Attaching one of these to a bathroom or kitchen cupboard door is a great way to eliminate more clutter in your life.